The AAC is pleased to announce Lonny Jarrett will be joining us in Denver April 23-24, 2016 at the Westminster Marriott for a two-day seminar entitled Treating Trauma with Chinese Medicine: Untying the Knot. About the class: In this class Lonny will discuss how to diagnose and treat trauma with Chinese medicine. We will consider the heart/kidney axis as the physiological foundation of stability and how to restore integrity to this most important relationship. Lonny will emphasize the importance of the practitioner's awareness of the dimension of self that is never wounded or traumatized as a gold standard in diagnosis and treatment. In this regard, the practitioner's own integrity will be considered as the root of efficacy in treatment. The class will be rooted in an appreciation of the core dimensions and capacities of the self, including the spirit, ego, emptiness, soul, conscience, and the will. About Lonny: Lonny S. Jarrett, M. Ac., author of Nourishing Destiny, The Inner Tradition of Chinese Medicine and The Clinical Practice of Chinese Medicine has been practicing in Stockbridge, Massachusetts since 1986. He is a founding board member of the Acupuncture Society of Massachusetts and a Fellow of the National Academy of Acupuncture and Oriental Medicine. He holds a master's degree in neurobiology and a fourth-degree black belt in Tae Kwon Do. He was recently featured in the text, "The Great Work of Your Life: A Guide for the Journey to Your True Calling" by best-selling author Stephen Cope. Lonny hosts NourishingDestiny.com, an online community for 3000 practitioners of Chinese medicine worldwide. The AAC has arranged room rates of $119/night beginning Friday, April 22nd. Please make your reservation before Tuesday, March 22nd to guarantee a room at this rate. Hello and Happy New Year! We are so excited to have Lonny Jarrett coming to our conference to share his knowledge with us. Please reserve your place early, as last year we sold out and we want everyone who would like to learn from him to have the opportunity to do so. Dry Needling: The AAC continues to explore the very important and current topic of Dry Needling. Research of safety issues as well as historic legislative and policy documents is costly. If you would like to contribute to the cause please see our T-shirt campaign below and/or contact me directly at President@acucol.com or (970) 214-6683. We will give you a full report on this topic at our annual meeting in April. Even if you can’t attend the entire conference please join us for our annual meeting 1:00 - 2:00 on Saturday, April 23rd at the Westminster Marriott. Injectables: We continue to work on obtaining the right to procure injectables following the passage of our bill last spring. The process has been long and intricate, involving several stakeholders. We have participated in meetings leading to DORA preparing a list of allowed injectable substances, rules for training and proposed changes to the pharmacy practice act that will enable us to purchase compounded substances again from in-state companies such as College Pharmacy. (1) Dextrose; (2) d-glucose; (3) Enzymes except urokinase; (4) Glucose; (4) Homeopathic Substances (to only include those that are within the US Pharmacopia); (5) Hyaluronic Acid; (6) Minerals; (7) Saline; (8) Sarapin; (9) Sodium chloride; (9) Sterile water; (10) Traumeel; (11) Vitamins; (12) Cyanocobalamin; (13) Lidocaine; (14) Marcaine (Bupivacaine Hydrochloride) with or without epinephrine; (15) Oriental Herbs; (16) Procaine; and (17) Vitamin B-12. (2) Colorado licensed/registered acupuncturists, direct-entry midwives, or naturopathic doctors who are located in Colorado and authorized by law to obtain the drug. The Director of DORA has up to six months from our last meeting on October 23rd to sign the rules into effect. So it could be as late as April before we are able to obtain injectables again. We will continue to keep you apprised of our progress on this subject. Make sure you are following us on Facebook and are signed up for our Yahoo Group to get the most timely updates. ASA: The next American Society of Acupuncturists meeting will be held March 3rd and 4th in Albuquerque, New Mexico. The AAC will be sending two representatives to participate. This important newly-formed national organization helps keep our fingers on the pulse of AOM issues and to have a voice in the progress of our profession nationally and globally. Because the AAC is a member organization of the ASA, AAC members get free issues of the peer-reviewed Meridians Journal of Acupuncture and Oriental Medicine. See the announcement below about the winter issue, ready now for download. Thank you for your continued support and membership, and I look forward to seeing you at the conference in April. Order Your Year of the Monkey T-Shirt by January 24th! The beneficial effects of Acupuncture have gained recognition among other health professionals, but are still largely misunderstood by insurance companies and law makers. The AAC is working to keep Acupuncture safe and legal in Colorado. Our efforts at this critical time in our profession are costly. You can support Acupuncture and Oriental medicine in our state by purchasing this cool T-shirt that celebrates the Year of the Monkey. Please help us reach our first goal of 50 t-shirts before January 24th. You should then receive your shirt by February 11th. (There is a $5 shipping fee in addition to the cost of the shirt.) You may also make an additional or separate donation to our cause. Thank you for your support! Click Here to Purchase your T-shirt! The association is doing well with its limited funding, however we still needed to dip into our savings in 2015. A large portion of our budget goes to paying our lobbyist, Leo Boyle, who has been working on our behalf for over a decade. He is a seasoned professional, is well-known and well-liked at the capitol and we couldn’t have passed our injectables bill without him. We were able to negotiate a lower base rate with him for 2016, which will increase if he needs to take legislative measures for us. We are continuing to pay the attorneys who researched and drafted our injection therapy bill on a monthly payment plan. Our continued research of the Dry Needling issue is expensive. We would also like to have enough funds for educational outreach to the public about the benefits (safety and otherwise) of seeing a licensed acupuncturist, and we have discussed hiring an executive director to help our all-volunteer board represent you more effectively and efficiently. However, our funds are currently stretched to the max. Please help us to increase our membership by spreading the word about how active our association truly is and also see the T-shirt campaign in this newsletter. We also hope you will attend our annual conference, which not only provides CEUs and sense of community for Colorado acupuncturists, but is also a fundraising opportunity for your professional association. The Acupuncture Association of Colorado is looking for their next Treasurer. You can be a part of the executive team of the AAC and help the board to protect and advance the acupuncture profession in Colorado. Bookkeeping skills are a plus, but the association does have bookkeepers. As the current treasurer, I will give you thorough training and will be your teammate until you feel comfortable in your new role. Would you like to join a dynamic group of people working for positive change? If you have any questions or would like to discuss the possibilities, please email me at Treasurer@acucol.com. Thank you, and I look forward to seeing you at the conference! Your Free Winter Issue of the Meridians Journal is Ready for Download! The winter issue, v. 3 no. 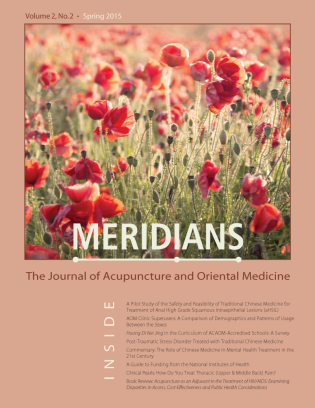 1, of Meridians: The Journal of Acupuncture and Oriental Medicine is now online! This and all issues of the peer-reviewed, Medline compliant journal are available free to you as a valuable benefit of being an AAC member. To access your download just click on “Register” to create a new account at their website and self-certify that you are a member of a State Association. You will be able to place an “order” for the zero-cost PDF downloads. You do not have to do this for each issue, just the first time. After initially registering, all you have to do is log in when a new issue is uploaded. If you have any questions about access to the online issues, please feel free to contact the webmaster, Brian Smither, at webmaster@meridiansjaom.com. He will be happy to assist you so you can read this issue and all issues of Meridians JAOM. Clinical Pearls Call for Submissions: How Do You Treat Erectile Dysfunction in Your Clinic? Chinese medicine is a beautiful and natural way to approach health and healing. One of the most notable and well-researched applications of acupuncture treatment is to relieve pain. Any kind of discomfort can be considered pain, including physical and emotional. As many of us are aware, our current society has a quick-fix mentality. When we have acid regurgitation we are prescribed a pill, when we are in pain we are prescribed a pill, when we are depressed…and so on. This method has led us down a rabbit hole leading to addiction, dis-ease and overdose. In the state of Colorado alone an average of thirty five people die from opiate use each month. As practitioners of Oriental Medicine it is our duty not only to treat those that come to us for healing but to educate them and our communities about healthier ways of living. Joe Brady, L.Ac. and Jacqui Shumway, M.A. of the Young Living Institute in Denver are preparing a report to present later this month to the Colorado Department of Health Care Policy & Financing demonstrating that Chinese medicine is more effective than opiates in treating pain. Their goal is to persuade the CHCPF to encourage health care organizations to revise their strategies for the treatment of pain to include approaches such as acupuncture and other traditional therapies as a viable alternative to opiate prescriptions. They have been collecting high-quality research articles showing the effectiveness of acupuncture, Chinese herbs and adjunct therapies such as moxibustion, cupping and gua sha in the treatment of pain as evidence for this report. As healers we ultimately want to extend our wealth of knowledge of health and wellbeing to those that may not have had access to this kind of information. This progression is invaluable to the acupuncture profession and to the communities we serve. As we endeavor to educate and influence the institutions charged with caring for the public’s health we are headed towards a healthier and more productive future for the citizens of Colorado. If you are aware of any research articles, white papers or position papers that could be useful in the presentation, please e-mail me at studentrep@acucol.com at your earliest opportunity. Thank you. Hello, members and friends of the AAC! Many of you have been waiting for a resolution to the procurement of injectables issue and I am happy to report that it is imminent. Our President Emeritus Scott Richardson and I have been in close contact with DORA, and next week there will be a Rules hearing at which a list of approved substances is expected to be presented by DORA as well any additional training that may be required. We should also have an answer about the manufactured vs compound debate. Please keep an eye on our Facebook page for an announcement after the October 23rd hearing. I'm pleased to announce that the AAC has officially become a voting member of the newly-formed American Society of Acupuncturists . If you are a member of the AAC, you have the benefit of being represented at the national level by the ASA. This November, the ASA is sending a representative to the Society for Acupuncture Research (SAR) meeting in Boston. SAR is dedicated to improving the quality and increasing the awareness of research in acupuncture, herbal therapy and other modalities of Oriental Medicine. SAR’s Board is comprised of both clinicians and research scientists. The SAR board spends their time and resources keeping an eye on what’s happening in the field of acupuncture research, with an over-arching goal of identifying gaps between research and practice, opening dialogue about issues that affect the global Oriental Medicine community, and hosting public conferences. Our representative from the ASA will be there to continue building bridges between research of our medicine and how it can impact legislation and advocacy of our profession. The ASA is simultaneously working on a Dry Needling committee at the national level to bring a national voice to the issues we are all challenged with. The AAC Board is aware and understands that our members are very concerned about the issues surrounding Dry Needling in Colorado and we are working diligently on your behalf to find the best path forward in our state regarding this topic. If you would like to be involved beyond your membership please call or email me directly. Lastly, I'm very sad to let you know that the board of directors is mourning the loss of Fundraising Chair Sue West, who passed away suddenly last month. Please see the memorial article in this newsletter and keep her family in your thoughts and prayers. Thank you for your continued support and membership. New Treasurer Needed: Get Experience Running a Non-Profit while Advancing Our Profession! I am the Public Relations Chair for the AAC and have a few goals in mind for the remainder of 2015. To start with, I would like to strengthen the presence of the Acupuncture Association on online forums. This will highlight the extensive ways our association provides activism opportunities, creates community functions and nurtures acupuncture support. Please make sure you are following the AAC on Facebook to see important announcements and events. Additionally, joining the AAC Yahoo Group enables you to directly interact with your fellow AAC members and the board, and get special members-only announcements. Another major focus is to increase the percentage of Colorado acupuncturists who are members, as well as garnering non-practitioner support. AOM Day, October 24th, is quickly approaching. 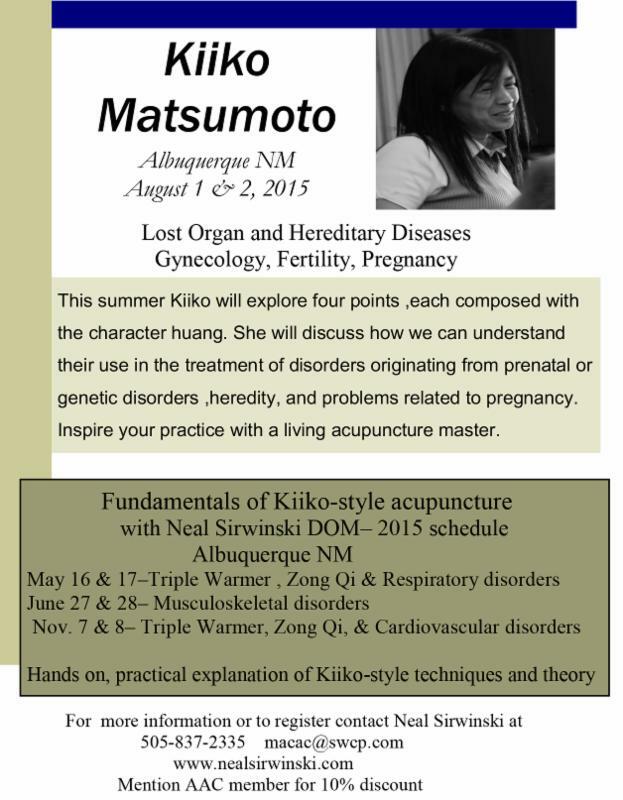 It is the perfect time to devise innovative ways to promote acupuncture to the public while growing your practice. Empathizing with different perspectives can inspire engaging ways to interact with the prospective AOM patients. The NCCAOM and the American Society of Acupuncturists have created materials to help you educate your patients and community about Acupuncture and AOM. Here is the link for free downloads of AOM Day materials: http://aomday.org/get.html. If you are holding an event, you can list it for free here: http://aomday.org/programs.html. If you have any questions or ideas please send me an email at PRCOMM@acucol.com. We are pleased to announce that our 33rd annual conference will be held April 23-24, 2016, at the beautiful Marriott Westminster. We have negotiated a $119 nightly room rate for attendees wishing to stay at the hotel. Follow this link to the Marriott Westminster website if you would like to check it out. As previously announced, Lonny Jarrett, author of Nourishing Destiny, will be joining us for a two-day seminar entitled Treating Trauma with Chinese Medicine: Untying the Knot. We are so excited to have this internationally-renowned author and speaker as our educator for the weekend. At lunch we will conduct our annual meeting during which we’ll discuss important business and how we can build a stronger profession together in Colorado. Looking forward to seeing you all in April, please stay tuned for registration information! Your Free Fall Issue of the Meridians Journal is Ready for Download! The fall issue, v. 2 #4, of Meridians: The Journal of Acupuncture and Oriental Medicine is now online! This and all issues of the peer-reviewed, Medline compliant journal are available free to you as a valuable benefit of being an AAC member. To access your download just click on “Register” to create a new account at their website and self-certify that you are a member of a State Association. You will be able to place an “order” for the zero-cost PDF downloads. You do not have to do this for each issue, just the first time. After initially registering, all you have to do is log in when a new issue is uploaded. For those of you who are not aware, it is with great sadness that we bring you the news that AAC board member Sue West passed away quite suddenly September 1st after a brief battle with stomach cancer. Attendance at her memorial on September 11th in Castle Rock overflowed the room. It was a moving tribute to an amazingly dedicated and compassionate woman, wife, mother, friend, practitioner and AAC board member. So many people spoke eloquently of how she had touched their lives and facilitated healing on many levels. She was incredibly passionate about Acupuncture and Oriental Medicine and devoted countless hours supporting our profession. For those of you who were lucky enough to get one of the AAC Acupuncture Presentation flashdrives at this year’s conference, you should know that this was just one of the multitude of projects Sue devised and coordinated. She would drive all over the state to talk with practitioners about what the association was doing and encourage them to get involved. Sue's kind and caring presence will be sadly missed by so many. Those of us lucky enough to have served on the board with her recognize that she is irreplaceable. Her contributions to the AAC and our profession, her patients, family and friends are immeasurable. We have lost a true advocate and a shining light. Her family has informed us that in tribute to Sue, donations may be made to The Denver Hospice or Colorado Cancer Research Program. There are options to becoming a member of the AAC. You can make a once yearly payment or use our automatic monthly payment option. Click on the link below. Thank you for supporting our advertisers!! My goal this year is to effectively carry on the work that the AAC has done for years–to track policy and legislation to be sure we are protecting your scope of practice, and to educate policymakers and the public to build awareness of Acupuncture and Oriental medicine to help your practice prosper–to be the voice and the ears of acupuncturists in Colorado. My hope is to also update the AAC’s systems and policies to help future boards transition easier and give new board members the tools they need to further strengthen our profession. In addition to this work, I’m proud that the AAC has been involved with the CSA (Council of State Associations) as they have gone through a lengthy process to start a new national association to help support our profession. After much debate and discussion the new organization has been named the American Society of Acupuncturists (ASA). They have had three teleconference meetings to date and the AAC is tracking their progress. By being a member of the AAC you are automatically a member of the newly-formed ASA and have national and international representation. For example, Vice-Chair Eric Buckley recently attended the International Standards Organization Technical Committee meeting in Beijing as a part of the U.S. ISO delegation to work on standards directly related to TCM. One of the concrete benefits you are already receiving from the ASA as an AAC member is free access to the peer-reviewed journal Meridians Journal of Acupuncture and Oriental Medicine. Please see the summer issue announcement further down in this newsletter. Another inherent benefit of being involved with the ASA is that we are constantly informed of current issues facing our profession. Through the ASA we have received a survey being conducted by the Oregon College of Oriental Medicine on attitudes toward the use of the term “Oriental” to describe our medicine. You can take the survey here. Please feel free to share this with other practitioners and your patients to help us gain a better understanding of the cultural norms and attitudes towards this particular word, and what it means to our community. This research could influence evolution of the terminology of our field. We are also learning how other states have approached getting included as an Essential Health Benefit under the Affordable Care Act and will use this information in our own efforts as we present to insurance companies and policymakers. We look forward to seeing additional value the ASA will add to our organization and membership. The AAC board of directors is excited to work for you in the year ahead. Please don’t hesitate to contact me directly if you have any questions about what the AAC is doing or have ideas about how the AAC can better serve our profession. Thank you all for your patience as we are trying to restore procurement rights of sterile substances for injection since our bill HB 1360 passed this spring. We have been calling local pharmacies and distribution centers letting them know of the recent change, but we are still waiting for DORA to promulgate rules and publish an official list of substances (this was part of the bill that was passed). We have been in contact with DORA on a weekly basis trying to expedite this process and resolve any concerns they may have on setting hours of training. If you want the most up-to-date information or would like to have a better explanation as to why this process is taking so long I invite you to contact LeAnne Duffy at DORA, as she is their Program Director of Acupuncture. Her contact information is: (303) 894-7796, leanne.duffy@state.co.us. It MAY be possible to order some products like cynocobalamin and lidocaine from College Pharmacy. We do not know for sure yet. We also have a contact from McKesson that is looking for a couple of acupuncturists to open up accounts to make sure the kinks are worked out for ordering from there. They have B12, Lidocaine, Epi-Pens, and more. The bottom line is that it won't be official until DORA finishes their part, but we look forward to letting you know when that happens! What goes on at AAC Board Meetings? The AAC meets every six weeks to discuss important issues that affect our members and to explore and coordinate actions we can take to support our profession in Colorado. Below is a brief summary of what was discussed during our last meeting. We are happy that our efforts have allowed us to procure injectables now! We continue to work with the pharmacies & DORA to complete the list of substances we need. Resources for procuring injectables will be listed on the Resource page of our website. Board members have been trying to make sense of the OSHA requirements and will continue to post information to Yahoo Groups, Facebook and the AAC website. Please see Membership Chair Sa’bura Goodban’s article in this newsletter for more info. The AAC voted to engage Brent Foster, who was the lead attorney on the successful cases to stop PT’s from dry needling in Washington and Oregon, to research case law and statutes in Colorado. He will be working with Kari Hershey, a Colorado attorney. They will submit a brief on legal options and the strength of any possible suit. The estimate for this work is $2,000 - $2,500. If it is decided that legal action is warranted we will need to raise at least $25,000 to proceed. The AAC continues to build and maintain relationships with companies that offer discounts, services, greater exposure and fundraising collaboration to acupuncturists such as Blue Poppy, BancTek, ZenVault and Colorado Medical Waste. Fundraising Chair Sue West is exploring how we can become a part of the Amazon Smile program as well. Sue is also continuing to work on presentations to insurance companies and decision makers regarding getting Acupuncture included as an Essential Health Benefit under the ACA. Former board member Anne Chew is assisting with this. They welcome any help. The AAC now has two student representatives who help us with fresh insight to our profession by offering us their time and feedback as well as involving the student bodies at Colorado acupuncture schools. Brittney, the student rep at CSTCM has conducted a student survey and is organizing the results. She is also setting up a student Facebook page. We are pleased to continue working with Charissa Haines, who provides the AAC with administrative services. Charissa fields all of your emails, phone calls and mail, helps members join and renew membership, sends out announcements and newsletters, and helps maintain or website and organize our annual conference. Thank you, Charissa! 2015 Feedback & Lonny Jarrett in 2016! Awesome all around: timing, preparedness, breaks, everything! Felt that all attendees were respectful, interested in material, and happy to be here. Best lunches ever! Great job! Good job. Well organized. Great meeting. Great experience! Thank you all for your hard work! Great to bond with other practitioners. Great speakers. Liked the location and lunch provided was a very nice bonus! The “lecturing at students” style kind of has its limits. Smaller groups? Conference style? Discussion groups? Start at 8AM so we can get out by 5:30-6:00. Chairs were very hard for the long lectures. Very uncomfortable. Location far from central. Why Colorado Springs? Otherwise, very nice. Room too long & narrow. Back tables too far from speaker. Hotel was nice by atrium very noisy. Very crowded on our first day. We thank you for your comments and will use them to shape future events. SAVE THE DATE - April 23-24, 2016! We are excited to announce that Lonny Jarrett will be joining us in Denver next year for a two-day seminar entitled Treating Trauma with Chinese Medicine: Untying the Knot. Lonny will discuss how to diagnose and treat trauma with Chinese medicine, considering the heart/kidney axis as the physiological foundation of stability and how to restore integrity to this most important relationship. Lonny will emphasize the importance of the practitioner's awareness of the dimension of self that is never wounded or traumatized as a gold standard in diagnosis and treatment. The class will be rooted in an appreciation of the core dimensions and capacities of the self, including the spirit, ego, emptiness, soul, conscience, and the will. Lonny S. Jarrett, M. Ac., author of Nourishing Destiny, The Inner Tradition of Chinese Medicine and The Clinical Practice of Chinese Medicine has been practicing in Stockbridge, Massachusetts since 1986. He hosts NourishingDestiny.com, an online community for 3000 practitioners of Chinese medicine worldwide. The conference will be held in the Denver area, and details about the venue will come later this year. Like this year, we will contract with a hotel that is attractive, well-maintained, and economical. We will find a ballroom with a larger capacity and better layout for accommodating the large crowd that we are. Looking forward to seeing you all there! Acupuncture Medical Reserve Corps is! Every day there are more stories about natural disasters such as fires, floods, tornados and earthquakes. Not only is our planet demonstrating this volatile state, so are we, its inhabitants and caretakers. There seem to be increasing stories of wars, riots and shootings. As practitioners of Traditional Chinese Medicine, we understand the principles and relationship of EXTERNAL and INTERNAL energies. We understand how to bring balance to our patients on an individual basis, but what can we do globally in the wake of so many disasters and traumas? You already have the tools to make a difference─your skills and knowledge of acupuncture. Colorado has a unique way for you to apply those tools. 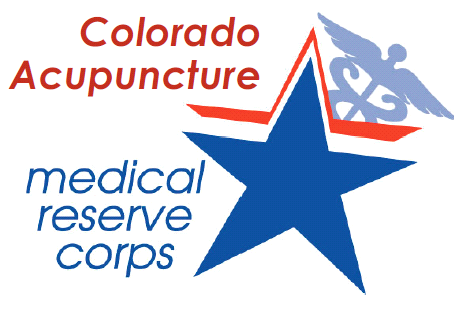 It’s known as the Colorado Acupuncture Medical Reserve Corps (CAMRC). All 50 states have Medical Reserve Corps (MRC) units, however Colorado has the nation’s first acupuncture-based, federally approved unit that deploys either on its own or with Behavioral Health units in response to disasters within the state. The CAMRC has responded to numerous disasters and events to assist in the immediate healing and long term recovery of the communities and people affected. As a result of the success with this program, other acupuncturists who have witnessed it or heard about it have requested assistance from the CAMRC to begin the process of creating acupuncture-based or integrated units in other states. Some of the more recent efforts outside of Colorado: Maryland has assembled a team of seven L.Ac.’s who have been NADA or AWB (Acupuncturists Without Borders) trained, and will be treating First Responders at this month’s MRC conference. In addition, a small group of acupuncturists have responded to the flooding in Texas, and there have been other states in contact to prepare for future needs. In Colorado we currently have 58 L.Ac.’s who have taken the CAMRC training, including the FEMA ICS 100/700 courses and become part of the CAMRC Team through the Colorado Volunteer Mobilizer. The CAMRC schedules three or four weekend training courses (with free CEUs) per year as well as an annual mock drill for disaster response. This year’s drill will be held on October 4, 2015, and will be deploying teams to three different locations (Colorado School of TCM, Southwest Acupuncture College, and the Institute of Taoist Education and Acupuncture). Even if you have not yet taken the CAMRC training course you can still be involved as a volunteer evacuee for the drill and experience treatment from our response teams. This is a great opportunity to learn what it is all about and how you can use your knowledge and skills to bring hope and healing in times of need. There is also a general CAMRC meeting at 3:30 pm this Sunday, July 19th at Southwest Acupuncture College in Boulder (6620 Gunpark Dr, Boulder, CO 80301) if you would like to get involved. Your Free Download of the Summer Issue of Meridians Journal is Ready! The summer issue, v. 2 #3, of Meridians: The Journal of Acupuncture and Oriental Medicine is now online! This and all issues are available free to you as a valuable benefit of being an AAC member. To access your download just create a new account at their website and self-certify that you are a member of a State Association. You will be able to place an “order” for the zero-cost PDF downloads. You do not have to do this for each issue, just for the first time you access them. After initially registering, all you have to do is log in when a new issue is uploaded. Hey there acupuncture students–I hope everyone is having a great summer! I have a couple of updates about student matters that could be of interest to you. I put a survey out to the acupuncture students of Colorado at the beginning of the year. Thanks to those of you who participated for all your efforts and responses. The results are in! The only problem is I couldn't think of a simple way to get the results to the student population. I'm working on creating a Facebook page for acupuncture students in Colorado where we can post questions/responses from us to the AAC, updates on legal information, the AAC meeting minutes, and more. I think it's important to stay involved and informed even at the student level. Eventually the acupuncture field in Colorado will depend on us to thrive. So, let's start building our community! The page will be up and running by the end of July. If you have any other burning questions or would like to get involved you can always e-mail me at studentrep@acucol.com, or if you attend SWAC in Boulder, you may like to reach out to our new rep Allicen Maier at studentrep2@acucol.com. We look forward to connecting with you! In writing a ‘Press Release’ for this book–a brief introduction and overview–I reflected on who it was most written for. As somewhat of an autobiography I realised that patients, students, friends and family may find it of some relevance, but the principal audience is the members of the Acupuncture Association of Colorado–not least because I was a member of the AAC from its beginning. Who else would be more interested in what it has to say–technically, practically and professionally? And it contains my ‘practice secrets’, which helped keep me in full-time practice in Boulder for over 30 years. These may be of some curiosity to other practitioners. The Adventurers of an Acupuncturer is the story of 35 years of ‘working with energy’ with a wide variety of patients...my clinical autobiography of how Qigong became integrated with Acupuncture...and a personal means of summarising life as a practitioner so far. I began Acupuncture practice in 1977, in London, England. In 1981 I took what was to be a one-year sabbatical to Boulder, Colorado. A third of a century later I finally returned to my hometown of Liverpool in 2013. During these years I discovered Qigong, and over the course of time integrated it into my clinical practice. This book is the story of those adventures. My hope is that you will find this text of some value, and that it will provide another perspective on combining Acupuncture and Qigong in clinical practice. And also that it is accepted in the spirit of homage to practitioners everywhere who are doing, and pioneering, this most astonishing and miraculous work with the energy system. This e-book can be downloaded free at www.globalqiproject.com. Please note that it is 4+ MB in size, so may take a little while to download. As I am finishing up my term as president and my third year volunteering with the board, I am so proud of the work that has been accomplished and the opportunity I have had to serve with these fellow practitioners. I am absolutely confident that the organization will continue to grow with the members serving on the board. I also invite anyone who is passionate about our medicine and who wants to become more active in the community to come to the board meetings and volunteer on a committee or on the board. It will broaden your understanding of what it takes to be a licensed healthcare practitioner in the US and to keep the practice of our medicine growing in our state. This past year has been trying for those that practice injection therapy, but we have made some amazing progress towards resolving that issue. We have worked closely with the Colorado Medical Society in our attempts to re-gain the ability to procure injectable substances and I can’t recall another time when our two organizations have collaborated to this degree. We have built bridges that will continue to serve us for years to come. We also met with Insurance Commissioner Salazar and her staff regarding attaining Essential Health Benefits status under the Affordable Care Act in Colorado. We are now awaiting the announcement of the group of plans from which the next model health plan will be chosen and will then continue to advocate for the selection of a plan that includes Acupuncture as a covered benefit. We also have another project coming up this summer that I am really excited about. It is extremely important that we have your most recent contact information to keep you informed of these important events. While I cannot go in to too much detail now, I promise that it is something that we will all celebrate. We will need your help to get as many people involved as possible, so please, reach out to other acupuncturists and spread the word. Again, I want to express what an honor it has been to serve with my colleagues on the board. In speaking with past AAC presidents they have been impressed at the level of cooperation and community that we have. While I am looking forward to having a little more time when my term is complete at the end of this month, I promise that I will continue to be involved and assist however I can. Thank you all for the opportunity to represent our profession and this wonderful community of healers in Colorado. Vice President's Report - You are an Acupuncturist! Some of you may or may not know that our profession hasn't had a Standard Occupational Classification Code (SOC) designation with the Bureau of Labor and Statistics (BLS). The NCCAOM has been working diligently to get us a designation and it appears that it will be happening soon. Even though the designation will not be completely official until the comment and review period is complete in 2017, you are an Acupuncturist and should be using that word as your profession or occupation in any legal or tax documents. For example, when you file your taxes your occupation should be listed as "Acupuncturist." This consistency allows data collection on employment, unemployment, salaries, etc., so we can get funding and create jobs. It will help open doors to working in hospitals and could lead to student loan forgiveness. So when the Census knocks on your door and asks you what your profession is you say “Acupuncturist!” We know you do A LOT more than just acupuncture but this designation will help legitimize our profession. For more information on the NCCAOM’s efforts visit http://www.nccaom.org/bls. This past year has been an incredibly busy one for the AAC. We do our best to keep you up-to-date with our quarterly newsletters. As Scott wrote in the President's report, there has been a lot going on legally regarding Injectables and our right to procure them, as well as our efforts to gain Essential Health Benefits status under the ACA. Dry Needling continues to be a concern and we will be posting informative documents on our website. Please stay tuned. Our Vice President Kimberley Benjamin has been keeping us apprised of developments in the Council of State Associations and along with our new board member Yvonne Piper attended their annual conference in March. The CSA is the most inclusive organization yet achieved in our profession and is tirelessly working to support the states in their legislative, education, publication and professional efforts on behalf of their association members. The November election kept our Legislative chair George Graf busy attending events to educate candidates about acupuncturists and our concerns. Thanks to those who responded to our call for donations, of the 20 candidates we supported, 15 retained or gained seats in the house and senate. We look forward to a productive relationship with the legislature during future efforts. Fundraising chair Sue West has been busy coordinating efforts to simultaneously support our organization and help practitioners by developing a Power Point presentation about Acupuncture and Chinese Medicine that can be used to educate your patients, referring practitioners and community. Her committee, including Anne Chew, Mark Van Otterloo and Yvonne Piper, has created and loaded this presentation and other helpful documents and articles onto a USB flashdrive that is available for a nominal donation. Jacqui Strike, our Public Relations chair has been busy posting to our Social Media and coordinating volunteers to run Interactive Educational Centers about acupuncture for the 9News health fairs. Donating time to this worthy cause helps people understand our medicine while gaining valuable exposure for your practice. Please keep this in mind and plan to sign up next spring! We continue to support the first all-acupuncture medical reserve corps in the nation, the CAMRC. Please visit their booth and consider becoming a volunteer. Their trainings are free and offer 10 pda’s toward NCCAOM recertification. Our Student Representative Brittney Chowning has been getting fellow CSTCM students involved. She coordinated a forum at the school to introduce a survey to find out how we can better serve our student members and what their concerns are. In addition to lending her expertise to many of the board’s efforts our conference chair Stephanie Shober has coordinated this amazing record-breaking conference that we hope that you enjoy. Last but not least, our Office Manager Charissa Haines has continued to support us in innumerable ways. Please make sure to thank her if you have the opportunity to call or email the office. Looking forward to seeing you at the conference! If you can’t attend, I welcome the opportunity to speak with you and hear any ideas or concerns you may have. The AAC is off to a great start this year. We are making progress in replenishing our accounts after our recent years of large legal expenses. These expenses included the Sunset Review of our Practice Act to keep our profession regulated in Colorado, and defense against dry needling. We have big goals for the coming years, and really need to get our membership numbers up. We currently have a powerhouse board dedicated to seeing some huge issues through, so now is the time to get your friends to join. Let's see what we can accomplish together! This is my second year volunteering on the AAC Board and it has been an honor. The knowledge and dedication of my fellow Board members are consistently impressive. The upcoming 32nd Annual Acupuncture Association of Colorado Conference being held April 25-26 in Colorado Springs has set an all-time record of 123 attendees for our state conferences! Meeting the venue capacity forced us to cap registration on Saturday when we will be learning from Master Jeffrey Yuen. There are still a few spots open for Sunday's excellent classes with Dr. Daisy Dong and Dr. Butch Levy. Please click here for more information and to register. The annual conference is held in April for a couple of reasons. In election years, an early conference allows us time to come together as a group to hear about issues and candidates that effect acupuncture and Oriental Medicine in time to take action. We also hope by following spring break time, the April conference finds many people in town and able to attend. Our conference is the one fundraiser that, added to membership dues, keeps us going. The annual business meeting of the Association being held during lunch on Saturday is a requirement of our by-laws and the one opportunity each year that we have as a group to learn what is happening legislatively for our profession, to brainstorm, and set goals. I look forward to spending time together as a group and learning new things from the great line-up of speakers we have scheduled. See you in April! Fundraising Report - Power Point Acupuncture Presentation on USB Flash Drive! I am so looking forward to seeing everyone at the 2015 AAC Conference; we are all very excited about our speakers and the entire event! I want to thank so many people who have put this together, but especially Stephanie Shober─ she has put her heart and soul into this conference. USB flash drives pre-loaded with ways to educate your community! The drives will be available for a minimal donation. If you will not be able to attend the conference but would like more information, please do not hesitate to contact me at Fundraising@acucol.com. Of course at the conference we will also be highlighting our continuing opportunities with Zen Vault, which offers secure storage and transmittal of medical records, and Banctek, offering low-cost merchant credit card processing services. Please visit Mark VanOtterloo and me at the Fundraising Table along with our other Vendors. I look forward to seeing you all. I am encouraged and astonished at how vibrant our Acupuncture community has become. It is fantastic to see the droves of volunteers pouring out to educate and assist our communities through the 9 News Health Fair and The CAMRC (Colorado Acupuncture Medical Reserve Corps). My term on the Board of the AAC is drawing to a close. If you are an enthusiastic self-starter, I encourage you to apply to head the PR department by writing me at PRCOMM@acucol.com. In this position you will be a member of the AAC board for the next 3 years and your tasks will include creating and managing the subcommittees that oversee The 9 News Health Fair, AOM Day, Social Media (Facebook, YouTube, Google+, Yahoo groups). Bring your new blood to the table. This position has been extremely rewarding for me over the last 3 years. I shall value and cherish all the friendships and connections I have forged. I have no doubt I shall always be an integral and reliant volunteer for the AAC and I look forward to passing on my knowledge to the new PR Chairperson. The 9 News Health Fair is great way to connect with Healthcare leaders in your community as well as an ideal opportunity to introduce your clinic to patients in your community. The Aurora, Mississippi Avenue Baptist church (Mississippi and I-225), needs a volunteer for the Tuesday, April 21st Fair from 7am to noon. You may sign up here or email me for more information at PRCOMM@acucol.com. Thanks to all the volunteers who are serving their community and spreading the good word about acupuncture. Communications Co-Chair Report - Can You Help With Our Phone Tree Project? Thank you to all the "phone tree-ers" who have helped us as we update our email list for all acupuncturists practicing in Colorado. DORA (the Department of Registrations) does not provide us with emails, so we are collecting them one phone call at a time. Our project is not yet complete, but we are on our way. Please forgive us if you receive a call and you are already get our emails, we do our best to use up-to-date records. Always let us know if you change your contact information so we can keep our list current and keep you informed. Being a "phone tree-er" is a valuable asset to the AAC; it allows us to contact many people in a short time. If you would like to become a volunteer "phone tree-er", you can call or email me using the contact information below. You will also have an opportunity to sign up if you are attending our conference at the end of the month. At last year’s conference a Legislative Phone Tree project was initiated. If you were on that list and wish to volunteer again, we thank you and ask that you sign up anew. We understand that events happen in our lives that keep us from having extra time to devote to a volunteer project, so if you sign up and for some reason aren’t able to help when called upon, please let us know. Thank you for your support of our profession! Spring Issue of Meridians Journal is Ready! The spring issue, v. 2 #2, of Meridians: The Journal of Acupuncture and Oriental Medicine is now online! This and all issues are available free to you as a valuable benefit as an AAC member. To access your download just create a new account at their websiteand self-certify that you are a member of a State Association. You will be able to place an "order" for the zero-cost PDF downloads. You do not have to do this for each issue, just for the first time you access them. After initially registering, all you have to do is log in when a new issue is uploaded. 2015 has already been an amazing and eventful year for the CAMRC. February marked the one-year anniversary since forming the first nationally-recognized acupuncture-only Medical Reserve Corps in the United States. Our volunteer membership has grown quickly and steadily, and now includes over 70 Colorado Acupuncturists and other NADA-certified practitioners. Last month, the CAMRC offered its first Durango-area training with the help of the amazing Durango Acupuncture Alliance. We appreciate the show of support from everyone who participated and extend a warm welcome to our newest members in Southwest Colorado! In May and June of this year, we will be offering two more trainings in Denver and Colorado Springs. Each weekend course will prepare volunteers to participate in a CAMRC disaster relief effort. The training will cover the structure of the unit, the mobilization process, the logistics of setting up and operating a mobile disaster relief clinic, the roles volunteers may find themselves in, as well as information on the NADA protocol. The training also includes a bonus 3-hour ICS 100/700 level course and certification for FEMA's Incident Command System basic instruction (a requirement for CAMRC membership). As always, these trainings are complimentary and offer 10 CEU's. What's not to love? Please stop by and talk to us at the CAMRC booth at the upcoming conference in April with the AAC, to whom we owe tons of gratitude for their help and tireless efforts to support the practice of acupuncture in Colorado. Find out more about the organization and what you can do to support public health, your profession and your community! Use Your AAC Member Benefits! We are currently in negotiations with Colorado Medical Waste to provide affordable Sharps disposal for our members that is more environmentally sustainable while being price competitive with mail-away disposal. Stay tuned for more information! There are options to becoming a member of the AAC. You can make a once yearly payment or use our automatic monthly payment option. Click on the link below. The PayPal option is fully-functional and we appreciate your patience as we continue to work to rectify any difficulties you may experience with our other payment options. Jeffrey Yuen to Headline the 32nd Annual AAC Conference! The AAC is pleased to announce information for the 2015 Annual Conference to be held April 25th - 26th at the beautiful Embassy Suites in Colorado Springs. 12 PDAs will be offered (NCCAOM pending). Jeffrey Yuen is one of the most sought after speakers on Chinese Medicine throughout the world. He is an 88th generation Daoist priest from the Jade Purity School, Lao Tzu sect and a 26th generation priest of the Complete Reality School, Dragon Gate sect. He apprenticed for more than 20 years in Classical Chinese Medicine and other Daoist healing arts with Master Yu Wen, who transmitted his lineage to Master Yuen before Master Wen’s death at the age of 108. He is recognized internationally as a Master of Acupuncture, Classical Chinese Medicine, Daoism, Chinese Herbology, Tai Chi Chuan and Qi Gong. He emphasizes the importance of Daoism in cultivating one's life and spirit to maintain health, and the use of Chinese Medicine for understanding and treating illness. Master Yuen conveys Chinese Medicine from a deeply spiritual perspective rooted in Daoism. His ability to elucidate and bridge western medical thought within the context of Chinese medicine offers an essential clarity to his students. Currently he lives in New York where he is president of the International Tai Chi Institute, and maintains a private practice with a special focus on helping people with cancer. He will be discussing the Chinese concept of Wind and how it relates to western Psycho-Neurology. Daisy Dong is the senior Chinese medicine practitioner and the first hired clinician of the Integrative Medicine Program of the University of Colorado Health Sciences Center. Dr. Dong received her medical training from the Beijing College of Traditional Chinese Medicine and finished fellowship at Dongzhimen Hospital for Acupuncture. She also received three Master degrees in International Health, Health Administration and Oriental Medicine in the United States. Dr. Dong has been a professor at Southwest College of Acupuncture for 14 years teaching Clinical Herbal Pharmacology and Integrative Traumatology. She has been a clinical faculty member of the University of Colorado School of Medicine teaching Integrative Medicine since 2005. Her background includes training and experience in all components of TCM including acupuncture, herbology, Tui Na, Tai Chi, Qi Gong, in addition to allopathic general medicine. She will be sharing her practical experience for running an effective evidence-based practice. Butch Levy is an integrative practitioner: board certified in Family Medicine and NCCAOM certified in Acupuncture. Dr. Levy has been in private practice for 37 years, including care from obstetrics and pediatrics to geriatrics and hospice care. In the late 1980’s Dr. Levy attended acupuncture school, completing many of the classes, but apprenticed with and was mentored by Miki Shima to complete his requirements for certification. Dr. Levy’s training in Chinese Medicine is in the Japanese style of herbal diagnosis using abdominal patterns, Fukushin, and his acupuncture style is distinctly toward The Extra Vessel and Divergent Channels. Dr. Levy’s current practice integrates allopathic care with Chinese medicine and Functional Nutritional Medicine, bridging east and west with comprehensive, practical approaches to illness. He sees a wide variety of patients, and his focus of interest is toward complex chronic disease including supportive care for cancer and autoimmunity. Dr. Levy will present an overview of his style of care with a direction toward explaining his approach using the Japanese training he has been most fortunate to receive from Dr. Shima. *Complimentary cooked-to-order breakfast is for conference attendees lodging at the Embassy Suites. ** Complimentary Evening Reception is for conference attendees lodging at the Embassy Suites. CLICK HERE TO REGISTER OR TO SEE MORE INFORMATION! The AAC has arranged a suite room rate of $99/night beginning Friday, April 24. Please make your reservation before Wednesday, March 25 to guarantee a suite at this rate. The $99 rate includes a two room suite with one king or two queen sized beds and a living room, complimentary cooked-to-order breakfast, complimentary evening reception, and complimentary parking. Check in time is 3PM. Check out time is 12PM. Please watch your email and snail mail for registration invitations and fun incentives! 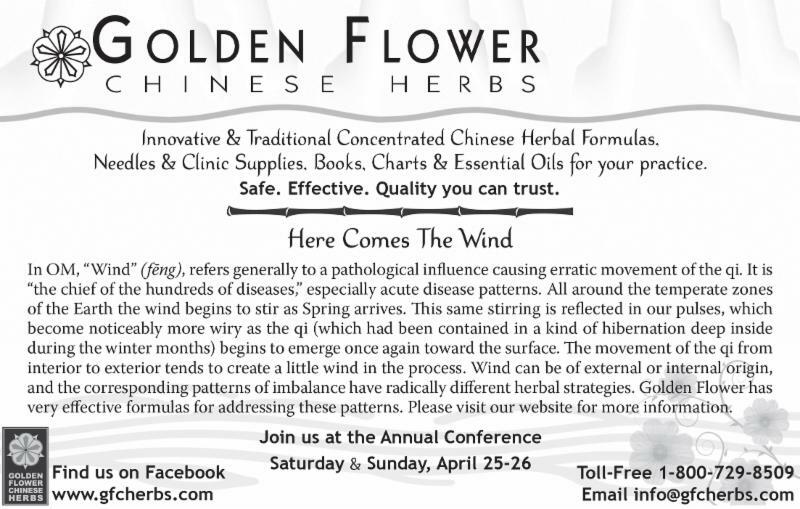 Thanks to Golden Flower Chinese Herbs for being one of our conference sponsors. 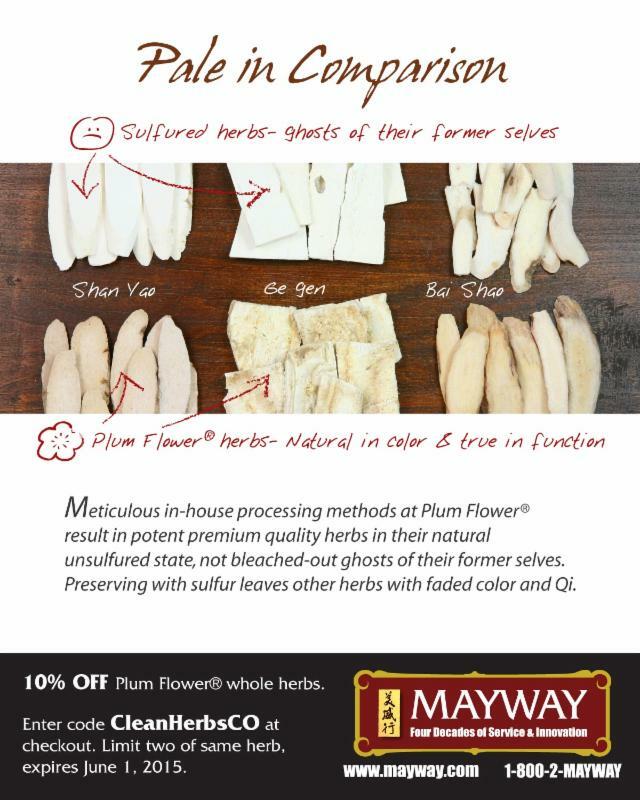 Golden Flower Chinese Herbs will be showcasing their latest Chinese herbal formulas and a fabulous line of artisan-quality essential oils. Enter the raffle at their booth for a chance to win a $100 gift certificate for the GFCH formulas of your choice during the drawing at Sunday's lunch break! We also thank Blue Poppy for being one of our conference sponsors. They offer herbal formulas at a price you can afford! They will be sponsoring Saturday's lunch! Happy New Year!!! As we move in to a new year it brings new opportunities. I appreciate everyone's patience as we have worked diligently to resolve the issues surrounding injection therapy. We have started a process that will once again allow acupuncturist to procure substances for injection and hopefully prevent this issue from happening in the future. It has been a long and difficult process that has involved multiple meetings with DORA, the medical society, and the pharmacy board. Again, we have come up with a solution that should permanently rectify the situation. I ask for your continued patience as we work to implement this solution. Dry Needling has continued to be at the top of our agenda. The AAC considers dry needling to be an acupuncture technique and strongly objects to anyone practicing it who does not explicitly have the right to perform acupuncture within their scope of practice. Again, with this new year come new opportunities to protect our patients and ensure that acupuncture is only practiced by qualified practitioners. But we cannot do it without your help and support. The only way that we can fight these battles and protect our scope of practice is through the physical and financial support of our members. We have an amazing lobbyist who is helping to educate our state representatives on the problems we are facing. We also have an extremely talented lawyer who has been working with the AAC for years and is very familiar with the legal arguments regarding dry needling. While everyone on the board is a volunteer, our lobbyist and lawyer are not. We cannot effect change without their help, and we cannot utilize their expertise without a strong membership base and financial support. If you are tired of other professions ignorantly using our medicine and you want to utilize the full scope of your training, I strongly encourage you to come to our conference. Learn how you can take an active role in furthering our profession. Invite your friends to come. Encourage other acupuncturists to become members. It is only through unity that we will survive and thrive. As always, I am happy to answer questions about what steps we are taking. Don't hesitate to reach out, and I look forward to seeing you in April. The AAC continues to stay involved at the national level. We will be sending two reps to the annual CSA (Council of State Associations) meeting in March. The collaboration and support that we gain from attending these meetings empowers our board to be more efficient and effective for you, our members. The CSA began as an informal networking group of state association presidents that met during annual AOM conferences. The presidents would explore issues facing their states and offer support and solutions to one another. This evolved into a more formally structured meeting referred to as the President’s Council (PC). Eventually, as additional state leaders began to join in, the PC expanded to include non-president representatives. It ultimately developed a charter, bylaws, code of conduct, and a new name: the Council of State Associations (CSA). The CSA has grown to be a collaboration among 37 state associations, representing the most inclusive umbrella yet achieved in our profession. The AAC has been involved with this group since its inception and feels it’s important to continue to be involved on behalf of Colorado acupuncturists. As we announced last fall, the CSA is supporting a peer-reviewed journal, Meridians: The Journal of Acupuncture and Oriental Medicine. As a member of the AAC we are providing you with a pdf download of the Fall issue here: Meridians Journal Fall issue. When updates to our AAC website are complete we will be providing login and password information for future issues in the members’ area. The editors of Meridians are accepting submissions for their Clinical Pearls section on the topic of Thoracic Pain by February 1st, 2015. Please see their website http://www.meridiansjaom.com/ for more information. I look forward to seeing you all in Colorado Springs for a fantastic conference! You’ve heard the saying, “Whatever can go wrong, will.” While in the process of doing some essential website updates that certainly seems to have been true for us. We are still working out some kinks including issues with processing credit cards through authorize.net. PayPal is working fine. This should all be fixed soon, but we are so sorry for the inconvenience this has caused many of you. We are grateful to have you as fellow members, and we thank you for your patience as we diligently work within our budget to correct the problems. Here are some of the improvements we are making: We've updated our current website as a temporary fix until we can budget in a new one that is "more responsive," as our developer likes to say. We've also switched one of our payment processors to BancTek, who is giving us excellent rates and customer service. Another update is to our membership software, which was very outdated and starting to cause problems. Last but not least, we've hired a new bookkeeper, who specializes in non-profits and will be a great asset to keeping the AAC running smoothly. Again, we are sorry for the inconvenience, and we thank you for your patience as we continue working to improve your state association. See you in April at the conference! The AAC would like to thank all of the members who contributed their hard earned money in the waning days of the election. With your help and that of our friends at Blue Poppy and CSTCM we raised a few thousand dollars in a very short period of time. It enabled us to make a strong statement to officials that we deeply care about the advancement of the profession of acupuncture. And, we all voted—right? The AAC would also like to congratulate all of the candidates who won state house and senate seats in the November 4, 2014 election. Of the 20 candidates we supported, 15 retained or gained seats in the house and senate. We look forward to productive and meaningful relationships with all of them. Though many obstacles have been overcome by acupuncturists, many challenges lie ahead in this legislative session. With your continued membership support and participation our voices will be heard. Please don’t hesitate to introduce yourself to me at the conference in April! The 9News Health Fairs Are Coming!! Educate Your Community and Grow Your Practice!! One of the best ways to create awareness of our amazing medicine is to reach out to our communities. Yes, it is that time of year again. The 9News health fairs run from late March through April in various locations across Colorado. These fairs are Interactive Educational Centers (IECs) that are comprised of many different local and statewide organizations. They provide a wide range of health, wellness and safety information and education for the community. They draw thousands of participants—prospective patients!—every year. This is an excellent no-cost opportunity to get your name and face out into the community. I encourage everyone who has not reached full capacity in their practice to seek out the 9 News Health Fair in their area and volunteer to represent your profession through the AAC. I will be posting available health fairs both on the AAC Yahoo group and the AAC Facebook page as I receive invites. Donating your time to this worthy cause will help people understand our medicine while gaining valuable exposure for your practice. Sign up with a friend and make a fun day of it! The AAC will equip you with a 9News Health Fair Kit. Please contact me if you are interested. Then you can tell me your success story at the conference at the end of April! We have created a brief survey for the acupuncture student population of Colorado. We are trying to get an overview of how the students perceive the AAC as a whole and what types of services you expect from your state association. There will be a forum on Saturday, February 7th, at the Colorado School of Traditional Chinese Medicine in Denver at 12:00 p.m. to introduce the survey. Lunch will be provided as well as an opportunity to ask the president of the AAC any questions you may have. If you can't make it to the forum do not fret, there will be a copy of the survey on Survey Monkey that you can take to help us in our quest for understanding. The link will be released in a few weeks. Thank you in advance for giving us your time and opinions as the more students who respond, the better the AAC can endeavor to meet your needs. Have an excellent semester and stay sharp! It is rare that a week goes by and I don’t get a phone call or an email from a practitioner asking what can be done to improve an issue within our scope of practice. Right now, during this election period, every single one of us has the opportunity to let our voice be heard and help improve how our medicine is perceived and practiced in our state. We each need to learn about who is running in our area. Who is the better candidate? Who will cultivate an environment that allows us to treat our patients the best way we know how and to have a thriving practice? Please read the Legislative Chair’s report below to see key districts in this election and use ballotpedia.org to find out if you reside in one of them. Our organization is not as big as, and does not have the funding of the other medical associations. We cannot make the same size donations that they can. The best way we can let our voice be heard is by people volunteering with a candidate and walking his or her area. It provides an opportunity to learn who your representatives are and to let them learn about who we are as a profession. We are getting calls almost daily from campaigns asking if we are going to contribute again to specific candidates. Believe me when I say that they remember who donated and volunteered when it comes time to vote on a piece of legislation. We need as many of you out there as possible representing our profession and helping to move it forward. The AAC needs to make more donations before the election. If you can contribute any amount at all to help us make an impact, please use this secure PayPal button. We have a big year coming up. There are problems that need to be fixed and we have an amazing group of people working to make that happen. If there are issues coming up that you don’t like, please help us make a change. If you want to see this powerful medicine be more fully utilized within our healthcare system, help us make that happen. We cannot do it alone. We are here to represent you and the only way we can do that effectively is if you work with us. Again, we have an amazing group of professionals on the AAC board. I feel honored to have the opportunity to work with them. If you don’t know who we are, or don’t know the issues we are facing, please—come to a meeting, introduce yourself, and take an active role in our profession. There are many tight legislative races in Colorado this election and the AAC is doing all we can for state legislative candidates who advocate for acupuncturists. In August Leo Boyle (our awesome lobbyist) and I went to a fundraising event in downtown Denver that was well attended by many of the candidates who support acupuncturists. We handed out our budgeted $2000 in campaign contributions to key candidates to remind them we are here and want to be counted. Unfortunately that amount is a drop in the bucket compared to other organizations that were giving the maximum amount of $400 per candidate. Our budget only allowed us to give half that to the candidates at this event (and there are others who are calling daily to ask if we can support them again this year). This was a soft touch event and I was still able to bend the ears of several candidates, reminding them of our continued plights: fighting professional discrimination, not being able to procure injectables, getting to the table to achieve essential health benefit status and the dry needling controversy—I was a bit of a nudge. Now that we have dipped as deeply as we could into our coffers, we are asking you, AAC members, to contact campaigns in your districts and give your time by phone banking, giving a personal money contribution or door knocking. This would be great exposure for us professionally and can really make a difference for these legislative campaigns that operate on shoestring budgets. The election is just a few weeks away and the candidates in your districts can really use your help in the home stretch. Here is a list of candidates in key races that you can contact. Their websites are easy to find by searching their names. You can use www.ballotpedia.org to easily find out if you reside in one of these key senate and house districts. If you have any questions please feel free to contact me. Thank you. In this election year our lobbyist Leo Boyle carefully chose candidates for our $2,000 contribution budget this year. He requested an extra $3,000 to keep our contributions on par with the physical therapists and chiropractors. Unfortunately, we were unable to comply. These other organizations have triple the membership and higher dues than we have. Our political fund consists of half of the dues we collect. We use this fund to pay our lobbyist, to pay our lawyers when they are combating issues such as dry needling, and also for campaign contributions to keep our interests in our legislators’ minds. In Colorado we still have 70 percent of acupuncturists who are not yet members of the AAC. Please help us spread the word that their support would make a big difference! I once again want to thank all board members for a terrific job. Their work shows on the home page of the AAC website, it shows on YouTube, it shows on Facebook, and we are showing all of this to the public. BRAVO! The Fundraising committee has been busy promoting classes through Standard Process with Michael Gaeta as the presenter. June’s class on the Thyroid was held at SWAC, September’s class on the Autoimmune System was just held in Castle Rock, and we can look forward to the class on the Cardiovascular System October 29th at CSTCM. These classes have been fundraisers for us. With the money made we will be able to provide public forums on acupuncture at libraries, “lunch and learn” classes at key businesses, and education on the benefits of our services to insurance companies. We are currently developing a PowerPoint presentation to allow anyone to be able to present, educate, and spread the word. I want to take this opportunity to thank Angie Pierce, Deb and David Martin and Mark VanOtterloo for coming forward to volunteer their services to the AAC board and its committees. This is a great time for our profession and a great opportunity to serve on the board, so again, I thank you. It’s Not Too Late to Promote AOM DAY and Revitalize Your Practice! As you probably already know, AOM Day is observed nationally on October 24th as part of an effort to increase public awareness of the progress, promise, and benefits of Acupuncture and Oriental Medicine. Both Governor Hickenlooper and Denver Mayor Michael Hancock have proclaimed October 24th as Acupuncture and Oriental Medicine Day in Colorado again this year. The Colorado Acupuncture Association would like to see as many events in the state as possible during October. You don’t have to stick with one day! Several marketing packets have been created to help you generate campaigns. Consider putting an event together yourself, or join with other practitioners in your area. In these toolkits are helpful descriptions for setting up health fairs and how to re-activate your patient contacts. You can download them all here Free Toolkits. Click here AOM Day for more information. The Council of State Associations has prepared materials to help us all implement a National AOM Day Outreach Campaign. Click here to download the Council of State Associations’ Outreach Toolkit. Acupuncture Media Works has been a generous supporter of this event. They have been instrumental in the creation of a free marketing kit and will donate profits to the Council of State Associations from the sale of AOM Day brochures that you can personalize with your clinic name. We want to hear back from everyone what events you are planning. AAC Members can post on the Yahoo Group email what you are offering so we have a full calendar of events listed on our website. You can also submit your event to be listed on the national AOM Day website. Let’s see how big an impact we can make! Halloween morning Friday, October 31st, Longmont United Hospital will hold a mock disaster drill with the theme of “Zombie Apocalypse”. The drill, which will be held from 8:30 a.m. to 12:30 p.m., will simulate an authentic zombie Armageddon, complete with moulage and tons of fun! The Colorado Acupuncture Medical Reserve Corps has been invited to set up a disaster clinic at the event, and volunteers are needed to treat an estimated 100 people with the NADA protocol. ANY Colorado licensed acupuncturist may participate; you do not need to be a CAMRC member to volunteer. Please contact Monica Edlauer if you are willing to brave the zombie apocalypse! The 2015 AAC Annual Conference will be Saturday, April 25 through Sunday, April 26. Based on survey feedback, the conference will be held south of Denver in the vicinity of Castle Rock or Colorado Springs. Please mark your calendars! These survey comments are a good example of the many responses we received. We appreciate the feedback and are using it to shape the 2015 conference. Public education campaign about L.Ac. training versus DC, PT, etc. Thank you again for your participation and feedback, and for your membership support. Happy Summer! I know many of you have been following the injection therapy status. It has been a frustrating battle and we have good news and bad news. We have been working with DORA for the past 6 months to try and create a solution, but unfortunately there is nothing that we can do until the next legislative session in January. That means that for the next 6 months there are going to be limitations on being able to procure B12 and other substances for injection. So what’s the good news? Through this process, we have been working with the Colorado Medical Society (CMS) and the pharmacy association. Both organizations are supporting us getting the ability to procure the substances to do injection therapy. The CMS has also stated that they will help us write the bill for the next legislative session that will become law. I am not aware of any other time in our association’s history when the medical society has been as supportive and helpful to our profession in maintaining its scope of practice as they are right now. I believe that this is a great step forward in increasing communication between our two professions and building bridges that will only help us in the future. The other aspect of this is that when we pass this bill it will be law, and hopefully we will not have to deal with this again. I am sorry for the issues and frustrations that this has caused many of us trying to run a practice and provide the best care we can to our patients. There are a few places around the country that are rumored to be selling to LAcs. If you know of any, please tell your fellow practitioners. If you need help purchasing, especially B12, send me an email and I will do my best to help. Remember, the state still recognizes our ability to do injection therapy. If you are able to obtain the substances for injection, you can still do it. It is our ability to procure the substances necessary for injection therapy that we are trying to get back. Members are always asking what their association is doing for them. Your board is working hard within the political machinery on several important issues. The first one is getting legislation passed so that we can get prescriptive authority to procure substances for injection therapy. Through an oversight at DORA when a new bill was passed for the pharmacy industry in 2006 we were not included as being able to buy the substances that we have always purchased for injection. The problem has only been recently identified and was not on the radar screen when we did our sunset review. We have been working with the Colorado Medical Society and DORA and the Pharmacy board to come to a resolution. At this time it looks like we will have to have a bill passed by the legislature. THIS IS WHERE YOU COME IN: To get legislation passed we need FRIENDS in the legislature. To make friends we need to help our friends get elected.THIS IS AN ELECTION YEAR. This summer we need each member to be a registered voter. It doesn’t matter how you identify yourself. Register as an independent if you don’t know where you fit in the political system. Be sure and VOTE in the November election. Why does this matter? If we need you to call your legislator in the winter a staff member will check to see if you are a voter that needs to be paid attention to or if you are of no consequence because you do not vote. EVEN BETTER: find out who is running in your legislative district and offer to work on their campaign or send in a donation. Go talk to the candidates. Let them know that you are an acupuncturist. Stuff envelopes or offer to walk a neighborhood with them. Your board is working very hard for all of us. We cannot do this alone.Legislators want to hear from their constituents (people who elect them and that they represent). Dry needling is still on our radar and we continue to work on an effective strategy and long term solution to this thorny issue. George Graff is working to organize us into effective legislative district groups that can be mobilized on short notice when we need to influence legislation. Please return his call or e-mail if you are contacted by him. Thank you for your membership, your support and interest, and all that you do to help our community. Hi! My name is Robin Schiesser and I am the new Secretary for the Board of Directors. Even though I’d been a member of the AAC off and on for the past several years, last April’s conference was the first I’d attended and it really opened my eyes! This is an exciting and challenging time for our profession: We have the opportunity to be included as an essential health benefit in Colorado under the Affordable Care Act. We could receive our own professional classification under the Bureau of Labor and Statistics’ Standards Occupational Classification. We are facing discrimination by insurance companies for reimbursement of the services we are trained to provide and are trying to re-gain the right to procure injectables. These issues take time, energy and financial support. After practicing quietly for 12 years (four in Los Angeles, and eight in Boulder) I decided it was time to pony up and give back to the profession that I’ve so deeply enjoyed. I’ll be supporting the Board by working with our Office Manager and Newsletter Editor, Charissa Haines; coordinating the agenda and keeping minutes of our board meetings, which have increased to twice quarterly due to the amount of work to be done; and helping other committees with their projects as needed. Please don’t hesitate to contact me with any questions, concerns or ideas. Most of all–please consider volunteering for a committee and encourage any acupuncturist friends you have that aren’t members of the AAC to join. As we all know, medical doctors, chiropractors and physical therapists are very well organized and their professional associations have large numbers of members. That translates into greater financial and political power. Together we can turn up the volume on the voice of Acupuncture! When I was pregnant with my first child in 2001, I looked for a hospital in the area which offered midwife-led births and alternative medicine services. Unfortunately, these services were nonexistent in Boulder at the time. Thankfully, by the time I was pregnant with my third child, and newly licensed as an acupuncturist, the multifaceted health options for which Boulder was renowned had resurfaced at Boulder Community Hospital (now Boulder Community Health). The hospital was blessed with the Boulder Nurse Midwives, a team of exceptionally loving and gifted birth professionals. My midwives provided an amazingly supportive team, but I was determined to further enhance my birth experience with acupuncture. So, naturally I brought my own needles to the hospital. After 24 hours of leisurely labor, I became impatient and decided it was time have a baby. I treated myself as enthusiastically as I could, in the places I could reach, and went into transition shortly after pulling out the needles. Little Eevee made her appearance 20 minutes later. So who wouldn’t want the extraordinary support of acupuncture to reduce pain, increase the efficacy and expedience of labor, and support mom’s and baby’s health during delivery? Of course this became a priority in my private practice. My patients knew they could rely on acupuncture and herbal medicine to support them through fertility, conception, pregnancy, labor, and the postpartum period. Full service! Several years after my BCH birth, another one of my dreams manifested itself, and I became credentialed to practice acupuncture in the hospital – one of a handful of acupuncturists on staff as Allied Health practitioners. We worked hard to provide treatments to inpatients in every department where acupuncture services were requested. Every department save one. Acupuncturists at BCH have lacked the legal department’s clearance to treat patients in the Family Birth Center’s Labor and Delivery unit. To perform acupuncture in labor would have required an additional malpractice insurance addendum. The price tag on this particular addendum: up to $12,000 annually in addition to their current premium. An impossible amount for just about any acupuncturist. For two years I tried to find a way to bring acupuncture into L&D, spending hours of time calling, emailing, and note-writing the credentialing, legal, insurance, and birth center powers-that-be. I looked for loopholes in the legalese. I sought alternative malpractice coverage through a variety of companies. I appealed to the Center for Integrative Care at BCH to extend their department to complementary care in the Birth Center. I solicited letters of support from the ever-willing midwives and local acupuncture college. I sought employment directly through Family Birth Center. I went as far as to consider going back to school for a nursing degree so that I could become an employee of the hospital and gain privileges to the birth center directly. All, to no avail. The turning point actually came at this year’s Acupuncture Association of Colorado Annual Conference. Drew Henderson (also credentialed at BCH) and I both approached Marilyn Allen of the American Acupuncture Council to see what could possibly be done to make acupuncture in labor a feasible possibility for us. She said she would get back to us after the conference. It almost sounded promising. We did hear back, and what we heard was even more promising than we’d hoped. “You are covered,” Marilyn said. I wanted to frame those words in sunshine and hang them on the wall! But first, I needed to spend another couple of months emailing back and forth with the insurance underwriters, BCH credentialing, and the legal department to finalize and fine tune 7 pages of Acu-Labor-Addendum-ese and spend a few hundred (NOT a few thousand) dollars. SO WORTH IT! And as of June 26th, 2014 I am able to proudly announce (drum roll please)… Acupuncture Services in Labor and Delivery at Boulder Community Health! I feel like this has been my longest labor ever. Thank goodness for acupuncture to ease the pain. Hello, I am excited to be a board member of the Acupuncture Association of Colorado. I think our profession is awesome, and I joined the board to support our ability to be successful providers of this amazing medicine here in Colorado. Hopefully, we will serve as an inspiration for providers of this ancient art and science across the nation. Improving public awareness and access to this healing art is a big deal in today’s age of environmental toxicity and seemingly limited answers. Working with Carol Braverman, Chair of Public Education, to increase education of the public through increased media messaging (acupuncture is awesome! ), and toward that end, making the AAC YouTube channel a place for posting videos that serve to educate about our chosen field. Serving as a liaison with the student council of Southwest’s Acupuncture College in Boulder so that they know what actions we are taking to further our profession. And to encourage them to take action now and after graduation. Hopefully you find the idea of acupuncture having a stronger sway on public opinion to be a step in the right direction. Please share if you feel inclined! If you have videos on Chinese Medicine that you think should be on the AAC YouTube channel, or if you have articles on Chinese Medicine that you think should be on the AAC Facebook page, please e-mail me at: Comm.CoChair@acucol.com. I would like to congratulate and welcome our new members to the AAC. I look forward to working with you and will plan a visit with you to see how we can all work together. Please contact me at anytime. We all would love your ideas and help. I do want to thank all of the board members, and in particular Stephanie Shober, for a fantastic conference this year! We want to spread the word about our medicine and this conference was especially helpful. We had the opportunity to meet Brad Claus, the COO of Zen Vault, at the conference where he was very helpful in meeting and talking to the members about Zen Vault. Brad has just informed us about the new opportunities that Zen Vault has to offer such as the technology to correspond with our patients via HIPAA-compliant e-mail. Please go to our website under Special Events to learn more about Zen Vault and all of the benefits in becoming a member. Remember to enter code AAC20 to receive 20% off Zen Vault. BancTec is a new fundraising project for the AAC. We have teamed up with BancTec to provide credit card processing for our businesses. BancTec provides more benefits for our members and a profit sharing opportunity for the AAC. We are working hard to provide education and advertising of Acupuncture and Oriental Medicine. Please access our AAC website often to see all of the updates and member benefits that we are adding. We are working with Michael Gaeta to present two fundraising classes this fall. These classes are 3 hours, giving you 3 CEU’s. We will hold a class on the Autoimmune System October 2nd, 6pm to 9pm, at the Library in Monument, Colorado. This gives everyone who practices south of Denver easy access to one of our classes. The next class will be held at CSTCM on October 29th, 6pm to 9pm, and will be on Blood Sugar. E-mail’s will be forthcoming to sign up for these events. I encourage you to go to our website often to see all of the activities from all of the committees. We have a busy and fun filled year ahead of us creating unity, education, and advertising of our great Medicine. Coordinators do not have to be the Incident Commander if an incident occurs in your area!!! Applicant must be a CAMRC registered volunteer or intend to be within the next month. Please email me at lisa.nicodemus@gmail.com if you are interested in being a regional coordinator or have any questions! In true fashion, the Year of the Wooden Horse has speedily and deliberately raced by. Wow, we have six more months to go until this year is recorded in history. So what would our highest and best self do in the next six months to make this year memorable? This year we teamed up with the Colorado Acupuncture Emergency Response Corps (COMRC) and had a display at the Cherry Creek Arts Festival. The intention was to do sample treatments but with the temperatures being in the upper nineties this was not conducive. We hope to do this event again next year so keep the weekend of the 4th of July on your radar if you would like to volunteer. What is next? Our next event that all acupuncturists can use to cheaply advertise and draw more clients is Oriental Medicine Day (AOM day). The 24th of October is proclaimed AOM day by both Mayor Michael B. Hancock of Denver, and Governor John Hickenlooper of Colorado. We will be sending out useful tips on how to introduce yourself to the community and in return attract potential clients. Our work on the Non Profit Chapter of the AAC, The Colorado Acupuncture Outreach and Education, is not yet complete and so my task is to gallop on and have this project finalized so that we can better assist all the Non Profit ventures in Colorado. For example, the Colorado Acupuncture Medical Reserve Corps (CAMRC) and the Acupuncture for Veterans and their Families (VAF). We would also like to sponsor summertime booths at farmer’s markets around Colorado to introduce local volunteer acupuncturists to their communities. If you would like to serve on the committee of the Colorado Acupuncture Outreach and Education, Non Profit subsidiary of the AAC, do email me at PRcomm@acucol.com. The CAMRC is currently recruiting regional coordinators. Look at their article (above) to see if you qualify. Make these next 6 months of the Year of the Wooden Horse count. Get into your flow and participate in your acupuncture community as well as your neighborhoods. Hi my name is George Graf. I am a licensed acupuncturist here in Colorado and the new Legislative Committee Chair for the Acupuncture Association of Colorado, I’m honored and gratified to have been given this opportunity. I’ll do the best I can to make a meaningful contribution to our profession and I know that I have a great mentor in Anne Chew who has done a fantastic job over the past several years as the Legislative Committee Chair. The legislative challenges we face will take time and patience to resolve and we will need the whole acupuncture community to be involved in some way to overcome these challenges. Everything from voting to participating in the legislative phone tree. We need to respond quickly to regulatory issues that can have a profound affect on our ability to practice without being discriminated against by insurance, DORA and other health care interests. I have been practicing in Colorado Springs for the past 14 years and 2 years previously in California. I enjoy a thriving practice here, but I am aware that this is not the case for some acupuncturists in Colorado and that is a travesty. Everyone in our profession should be busy helping people with their health and wellness. We are the only experts in using needles to promote healing. No other profession can even come close when it comes to acupuncture or anything remotely looking like acupuncture. We are it; we should be confident that we have the most and best training in our field. But in Colorado professional discrimination has created barriers for acupuncturists to build busy practices. The reason I joined the AAC this past March and then accepted the position on the board, was that it became abundantly clear to me that a small group of people on the AAC board had worked tirelessly to protect our profession from deregulation and manipulation by other health care interests. Those changes would’ve put me and you out of business–I didn’t want to move back to California. Over the next several weeks I will be calling as many acupuncturists as possible to say hi and to get e-mail addresses of non-members of the AAC so that we can keep you informed about legislative issues, too. There are options to becoming a member of AAC. You can make a once yearly payment or use our automatic monthly payment option.